Some of the judges, patrons and Etisalat Nigeria top brass after the Etisalat Prize for Literature press conference. Alrighty folks. Here is another prize for you to try and get your mitts on if you fancy yourself a writer of no mean repute. 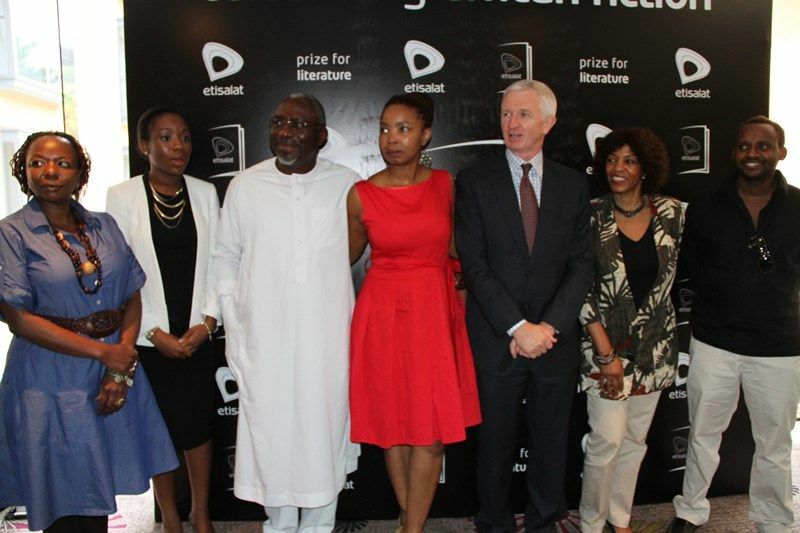 Wednesday saw the introduction of the Etisalat Prize for African literature in Lagos Nigeria. Yes, the Nigeria that beat our Harambee Stars at the football yesterday. The new prize has some serious literature folks looking through it including the chair Pumla Gqola who is associate professor in the Department of African Literature at the University of the Witwatersrand (South Africa) and one of South Africa’s most celebrated intellectuals. Also in there are Kenya’s own Kwani Trust Managing Editor (and Caine Prize almost winner) Billy Kahora, Professor of Creative Writing at the University of Ohio and winner of the Commonwealth Prize Zakes Mda and writer and academic Sarah Ladipo Manyika. No word on how much winners will get but its early days yet. And Etisalat are a major firm so its probably more than the Jomo Kenyatta Literature Prize hand out. We all know that’s not a lot. I’ll keep you posted. Next Next post: The Olare Mara Kempinski library; opportunities abound.